In 1932, Roosevelt was elected in a landslide. On the eve of his inauguration, he gathered aides and instructed them to call designated cabinet members to join him and his family at St. John’s church for a private prayer service. His braces and the additional attention his role as the President made every public appearance a media event. At first, he attended weekly prayer services. Then he exclaimed that he felt “like something in the zoo being looked at by all the tourists in Washington” even in church. With all the attention, eyes opened and on him, rather than reverently closed, he complained, “I don’t feel like saying my prayers at all.” So he stopped attending prayer services. Hidden in his job efforts organized by the Works Progress Administration is a little known project. In 1935, he paid scholars and specialists to record the nation’s past by interviewing a wide cross-section of Americans. It was the first ever comprehensive and focused approach to chronicle the nation’s past, to capture a ‘living history.’ Researchers were not prepared for what they unearthed, namely, the rich “prayer culture” that came alive with “detailed descriptions as people shared their earliest memories of prayer in their homes …” Unique prayer songs, known only inside a family or isolated community were discovered. Roosevelt then employed a team of artists to make these stories come alive in paintings and plays, songs and narratives. Murals were painted in public buildings. Theatrical performances, some that showcased prayer, were performed on small-town stages. The 40-hour workweek freed up Americans, giving them large hunks of time they previously had no control over. The two-day weekend allowed for many to return to church. As World War II threatened to move beyond the bounds of Europe, and it appeared that England could no longer stand alone without the involvement of the U.S., Roosevelt arranged to meet Prime Minister Winston Churchill aboard the battleship, the HMS Prince of Wales, on August 10, 1941. Churchill decided to have a Sunday service as a part of the rendezvous. The head chaplain offered a prayer. The band played “O God Our Help in Ages Past.” Those present say the two national leaders seemed to sing louder than anyone else. Then there were more prayers, “Save us and deliver us from the hands of our enemies…confound their devices; that we, being armed with Thy defense, may be preserved…” Churchill would later reflect on how deeply moving the service was as a symbol of the unifying shared faith. Four months later, on December 7, a Sunday morning, Japan would attack Pearl Harbor and sink four battleships, eighteen warships and destroy almost 200 aircraft. Thirty-five hundred would die or be injured. The Japanese would lose only thirty planes and only fifty-five men. After Christmas, Roosevelt called for a day of prayer, January 1, 1942, and he and Churchill stood together again, this time, in Christ Church in Alexandria, Virginia, the same church in which Washington had worshiped. They sang. They prayed. And then they planned. All over the nation, people lit candles, crowded into churches for prayer, and contemplated the possibilities. In the course of the war that followed, altars were erected in homes, and fathers and mothers knelt regularly to pray for sons far away and at war. Prayer vigils became common. The U.S. Government printing office went to work non-stop, twenty-four hours a day, producing religious materials to support the troops and the war effort with prayer books, Bibles, tracts, crosses and other religious images – Christian, Jewish and Catholic. 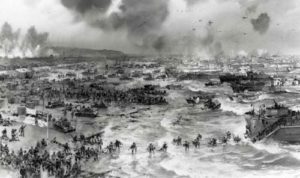 When allied forces invaded the shores of France, the D-Day invasion of Normandy on June 6, 1944, Roosevelt knew the insertion was daring and would be costly, that entrenched Nazi troops would put up a fierce resistance. 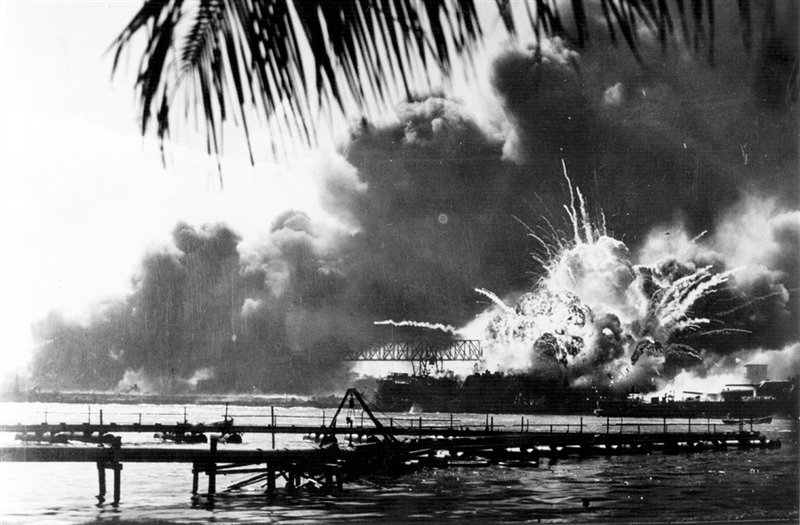 One million men would rush the shore from 5,000 ships and under cover from 12,000 aircraft. 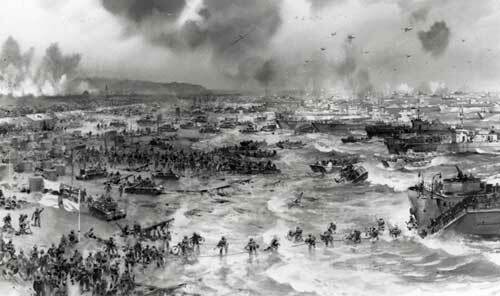 All of those on the ground were supported by two million more. It was the most aggressive military tactical endeavor in history. 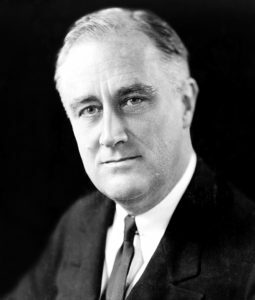 President Roosevelt called for supernatural assistant, the prayer support of the American people. And he prayed. Here is the prayer he offered during the many of his fireside chats. H. V. Horton, Atlantic Meeting (London: Methuen and Company, 1943), 100-101. Winston Churchill, The Grand Alliance (Boston: Houghton Mifflin, 1951), 431. Owen Collins, Ed. 2000 Years of Classic Christian Prayers (Maryknoll, NY: Orbis Books, 2000), 185-186. Samuel I. Rosenman, The Public Papers and Addresses of Franklin Roosevelt, Vol. 13, 1944-1945 (New York: Harper and Brothers, 1950), 152-153.